Duke finished his championship from the bred-by class in two weekends with five majors at the age of six months and nine days. 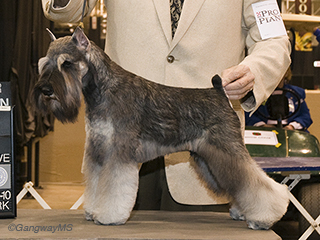 He is the second youngest Miniature Schnauzer to finish its championship and won a bred-by BIS along the way. He is the fourth champion for his dam Ch. Gangway's Jacueminot Jumpstart and the second for his sire Ch. Repetition's Its A Rap. He was bred, owned and shown by Bill Brown and Mary Jo Larsen. Duke is now the sire of an all-champion litter of three and more to come.